One type of Deia home that is increasingly popular – and hard to find – is a sea view villa within Deia’s village limits, with a pool and in walking distance to all the popular spots. If there is one particular area that ticks all those boxes, it is the area of S’Empeltada. Sunlight, space and stunning sea views. From it’s elevated position above the Robert Graves museum and the windy road down towards Cala Deia, S’Empeltada is perfectly placed. Cross the main road, and you are on your way to Cala Deia. 5 minutes by car, 15 minutes by foot. Turn right, and the road will lead you towards Soller, swiftly passing the areas of Calabat, Llucalcari, Son Coll and Alconasser. Turn left, and a beautiful, scenic walkway takes you into the village by foot in less than 10 minutes. This is floodlit by night and so comes in handy after yet another Deia night of quality eating, drinking or partying in Mallorca’s bohemian Mecca. The views in S’Empeltada are second to none. Here are the mountain views from the Son Elvira mansion in S’Empeltada, Deia. This luxury villa has panoramic sea and mountain views, 6 bedrooms with en-suite and large indoor and outdoor living spaces. For sale with Charles Marlow at €8,500,000. S’Empeltada is a modern urbanisation with small villa streets, gardens, lawns and proper neighbours. Still, the amount of privacy is surprisingly high. This is due to big plots, many with green areas, and a clever architectural layout that maximises privacy. Mostly though, the reason for S’Empeltada’s calmness is that no cars venture through here; people entering and leaving mostly also live here. Development in S’Empeltada has been going on since the 50’s, and it continues to be a popular spot to invest. All plots here are on urban classified land which means it is one of the extremely and increasingly few areas along the West Coast where you can build your dream home from scratch. In the local cladded style, of course, as per local regulations. As people increasingly flock to Deia between May and September, many holiday guests opt for a home in S’Empeltada. The reasons are obvious: lots of sunlight, pools with sea views, a high degree of modern comfort and walking distance to Deia’s amenities. As homes here are built within Deia’s village limits, can easier obtain rental licenses. This is somewhat a rare feat on the UNESCO-protected North-West Coast of Mallorca. The license allows you to advertise the property online and receive holiday guests for at least two months per year, sometimes more. This in turn increases house value in S’Empeltada as buyers are often keen on investing in homes that has a rental option. 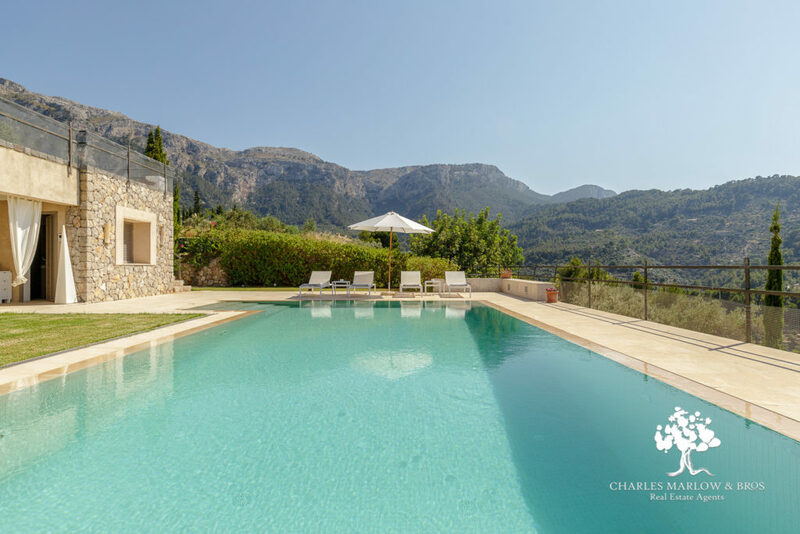 Ca Na Mar is one of our most popular rental villas. Placed in S’Empeltada with 3 bedrooms with en-suite bathrooms, a pool and great views, it has everything a family needs. An baby bed can be added to a maximum of 7 guests. €5,650/week all year round. If you want to know more about Deià and other villages in the Tramuntana Mountains, we recommend our Deià Guidebook. To read about more Deia areas, click here. Browse through our portfolio of Deia properties.